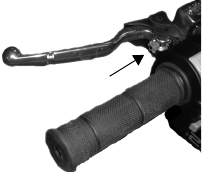 The hydraulic clutch lever is located on the left handlebar. the clutch. Disengage the clutch before shifting gears. smoothly, check the fluid level at the master cylinder. See page 55. If the lever begins to feel unresponsive, bleed the clutch system as outlined on page 152.